Buddhists around the world celebrate the benefits of worshipping Kannon (Avalokiteśvara), a compassionate savior who is one of the most beloved in the Buddhist pantheon. When Kannon appears in multiple manifestations, the deity’s powers are believed to increase to even greater heights. This concept generated several cults throughout history: among the most significant is the cult of the Six Kannon, which began in Japan in the tenth century and remained prominent through the sixteenth century. 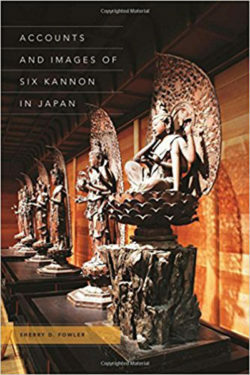 In this ambitious work, Sherry Fowler examines the development of the Japanese Six Kannon cult, its sculptures and paintings, and its transition to the Thirty-three Kannon cult, which remains active to this day.An exemplar of Six Kannon imagery is the complete set of life-size wooden sculptures made in 1224 and housed at the Kyoto temple Daihōonji. This set, along with others, is analyzed to demonstrate how Six Kannon worship impacted Buddhist practice. Employing a diachronic approach, Fowler presents case studies beginning in the eleventh century to reinstate a context for sets of Six Kannon, the majority of which have been lost or scattered, and thus illuminates the vibrancy, magnitude, and distribution of the cult and enhances our knowledge of religious image-making in Japan. Kannon’s role in assisting beings trapped in the six paths of transmigration is a well-documented catalyst for the selection of the number six, but there are other significant themes at work. Six Kannon worship includes significant foci on worldly concerns such as childbirth and animal husbandry, ties between text and image, and numerous correlations with Shinto kami groups of six. While making groups of Kannon visible, Fowler explores the fluidity of numerical deity categorizations and the attempts to quantify the invisible. Moreover, her investigation reveals Kyushu as an especially active site in the history of the Six Kannon cult. Much as Kannon images once functioned to attract worshippers, their presentation in this book will entice contemporary readers to revisit their assumptions about East Asia’s most popular Buddhist deity.